When Prime Minister Manmohan Singh, UPA Chairperson Sonia Gandhi and their allies line up for the annual photo-op this Thursday for the release of the mandatory “Report to the People” on completion of four years of the UPA government, the celebratory mood at the birthday bash will be tinged by underlying concern about what the future holds for them. The BJP today asked Prime Minister Manmohan Singh to instruct all ministries, departments and PSUs to put an end to the use of Congress president Sonia Gandhi’s photo in government advertisements and called it a “corrupt and unjustifiable practice”. After intense pressure from the opposition and academic circles in the state, the BJP government today sent the controversial Uttarakhand Universities Bill back to the select committee of the state Assembly. Murshidabad witnessed fresh post-poll violence today in which CPM activists directly clashed with Congress workers at least at five places and also in this district. The death toll today stood at 22. Normal life was today paralysed in Dimapur, the commercial hub in Nagaland, because of the dawn-to-dusk bandh called by the Congress against the “failure” of the State government to contain ongoing factional feuds among different groups of the NSCN rebels. With the resumption of composite dialogue between two neighbours in Islamabad from tomorrow, India and Pakistan are likely to push for more confidence building measures (CBMs) to lay the foundation of a durable peace if possible. Almost two years after the Centre held talks on the Kashmir issue with leaders of the Hurriyat conference, doors for resumption of dialogue between the two sides are again opening. Soon it would become mandatory for the imams in Uttar Pradesh to warn those who gather for the Friday congregation against suspected terrorist who may approach mosques for shelter. Tension prevailed in Hosur in Krishnagiri district of Tamil Nadu as angry mobs tried to cross the Karnataka border to smash liquor shops after eight more people died today, taking the death toll from Sunday’s hooch tragedy in the area to 16. The Centre and the Rajasthan government locked horns over Chief Minister Vasundhara Raje’s claim that a suggestion was made to put illegal Bangladeshi migrants in a “transit camp”, a charge refuted by union home minister Shivraj Patil. The Supreme Court today stayed the Madras High Court decision setting aside the merit list prepared by the Union Public Service Commission relating to civil services for the years 2006 and 2007. The Union Public Service Commission (UPSC) today regretted the offence caused to some sections of the society by the usage of language in two of the questions that appeared in the Indian History paper of the Civil Services (preliminary) Examination, 2008, held yesterday. Civil society organisations across Jharkhand are enraged at the way local police handled the case of murder of 36-year-old Lalit Mehta. Mehta’s body, which was recovered from the roadside on a stretch between Daltonganj and Chhattarpur, was sent for a postmortem, and buried after being declared “unclaimed”. The Punjab and Haryana High Court may have titled the scales in the general category’s favour, while filling up the posts of Additional District and Sessions Judges in Haryana. The Indian Army today took a serious view of the unprovoked firing from the Pakistan side of the Line of Control in the Mendhar area near Poonch in Jammu and Kashmir. This is seen as the third violation of the 2003 ceasefire in less than a fortnight. The other two being at Tangdhar and Samba, respectively. The Supreme Court today stayed the Kerala High Court order setting aside the election of CPI(M) MLA M.J. Jacob from Piravom Assembly constituency. The apex court, in an interim order, allowed Jacob to participate in the proceedings of the Kerala Assembly but on the condition that he will not have the power to vote and draw emoluments as an MLA. India could incur losses to the tune of $ 237 billion by 2015 due to rise in lifestyle diseases like diabetes, stroke and cancer because of unhealthy workplaces, a new WHO report has said. Highly critical of vulgarity in Hindi songs as well as those from other Indian languages, the first artiste from Uttarakhand to have Garhwali songs recorded by His Masters Voice (HMV) and Angel New Recording Company in the 1940s, Jeet Singh Negi, is a "broken" man today. To promote the production of bamboo and generate awareness about its manifold uses, the ‘poor man’s wood’ is being cultivated in the ‘demo village’ near Sahaspur, in Dehra Dun district, by the Forest Research Institute (FRI). After more than one and half years of probe into the Rs 1150-crore Barak missile deal with Israel, the CBI questioned former Defence Minister George Fernandes twice recently on alleged irregularities in purchase of the weapons system in the year 2000. A Jordanian cargo ship, with 10 Indians aboard, has been hijacked off the Somalian coast days after it left Mumbai carrying humanitarian aid. The ship has a crew of 21 persons, including 10 Indians, and the rest from Pakistan, Bangladesh, Tanzania and Kenya. The death toll in the hooch tragedy here and the Kolar district of Karnataka was on the rise, with at least 45 persons succumbing to the killer brew and more than 70 battling for their lives in hospitals. Arunachal Pradesh education minister Tatar Kipa today admitted that Rs 43 lakh was paid to a private contractor before the completion of the construction of pre-fabricated structures for seven schools in Kurumkumey district under the Sarva Shiksha Abhiyan. Religious events at Hardwar on the eve of Budh Purnima are proving as crowd pullers for the holy town, these days. Sant Bapu Aasa Ram’s Bhagavadgita satsang at Pantdeep, on the city's outskirts and Ram katha at another outskirt managed to pull lakhs to this town. A ruckus was created in presence of a legislator at the civil hospital here after the patients, accused a few doctors of forcing patients to purchase medicines from private medicine shops. The ministry of rural development has sanctioned Rs 696.39 crore to the National Rural Roads Development Agency (NRRDA) and the states of Punjab, Rajasthan and Uttarakhand under the Pradhan Mantri Gram Sarak Yojana (PMGSY) for the period ranging 2004-05 to 2008-09 respectively. The authorities have ruled out any threat to Taj Mahal and expressed satisfaction with the existing security arrangemnts. The police has identified the main suspect behind the robbery and murder of a watchman as well as a worker of a tubewell company’s workshop at the Chunna Bhatta road in Aghoiwala on Friday. Two persons were killed while another sustained serious injuries after they were hit by a bus in Udham Singh Nagar district on Saturday. International Labour Organisation (ILO) director-general Juan Somavia today applauded India's efforts in providing social security to poor, saying the country was making a determined effort towards the purpose. The Central Board of Secondary Education results of the Class XII examination will be announced on May 21 and 23. Athough it will not be publicly acknowledged, the UPA will predictably congratulate itself for successfully delivering on its “aam admi” agenda, members of the ruling coalition privately admit they have little to cheer about as they have failed in their primary objective of weakening the BJP and ensuring the collapse of the National Democratic Alliance (NDA). “What was the main purpose of forming the UPA ..it was not just to form a governemnt but to fight communal forces represented by the saffron parties. Clearly, we have failed in our mission,” remarked a despondent UPA minister who admitted that their political management has not been effective enough to counter the BJP-led NDA. In a desperate effort to win more friends, the UPA has even invited Samajwadi Party for its Thursday celebrations. When the Congress reached out to other coalition partners to form the UPA in 2004, they all believed it was their best opportunity to arrest the growth of the BJP, remove the Sangh Parivar’s stranglehold on the state apparatus and eventually ensure the exit of the allies from the NDA. UPA strategists had also calcualted that once Atal Bihari Vajpayee was no longer at the helm of affairs in the BJP, it would result in bitter infighting among the party’s second-rung leaders. Somewhere down the line, the script has gone all awry. After initial internal convulsions, the BJP has managed to put its house in order. The leadership issue has been settled, L.K.Advani has been declared and accepted as the PM-in-waiting by both the BJP and their NDA partners, while victories in Punjab, Uttarakhand and Gujarat assemblies has galvanised the BJP cadres. If the saffron outfit manages to form its first government in the South by winning Karnataka, it will prove to be the proverbial icing on the cake. Notwithstanding its current problems with its allies in Punjab and Bihar, there is a growing public perception that the NDA is on a comeback trail. In contrast , the UPA has an air of defeat about it even though the next General Election is still a year away. Its regional parties have lost considerable ground in their respective states. It has also not been able to shake off the general view that theirs has been a shaky, directionless coalition. Moreover, the government has been pushed on the backfoot on the twin issues of inflation and terrorism, which have provided fresh ammunition to a resurgent opposition. The Congress, UPA’s lead player, is groping in the dark as it failed to learn any lessons from the string of electoral defeats it suffered in the past year.“Our state units are plagued with serious infighting. We have not been able to project strong and effective state leaders. We have also not been able to come up with a strong political message,” said a senior Congress leader. In a written statement, BJP spokesman Ravi Shankar Prasad said that “the misuse of the government machinery and resources for partisan and political gains has been a part of the corrupt political culture of the Congress for a long time” as is evident in the routine and almost mandatory use of Sonia Gandhi’s photos in all government and public sector advertisements during the four years of the UPA rule. Prasad said this was improper and illegitimate as Sonia Gandhi held no official position in the government to merit a place in the official advertisements. “So long as she was the chairperson of the National Advisory Council (NAC), the government and the Congress at least had an excuse -albeit a lame one - for using her photos in official advertisements. That excuse has long ceased to exist after her resignation as the chairperson of the NAC, the wake of the office-of-profit controversy, and the subsequent disbanding of the NAC itself”, Prasad said. Now she is described in official advertisement as “chairperson of the UPA”, the BJP spokesman said and pointed out that this was not a governmental office but merely a “political title” that conferred no entitlements or legitimacy for being featured in media advertisements that were paid by the government. The party demanded that the Prime Minister’s Office instruct all ministries, departments and PSUs to put an immediate end to this corrupt and unjustifiable practice, Prasad said. He added that a directive to this effect must go immediately so that when the government completed four years on May 22, Sonia Gandhi was not projected in the publicity blitz that would be launched on the occasion. After May 22, the UPA government would enter the last year of its tenure in office and parliamentary election would have to be held withing the next 12 months, Prasad said. He added that in this election year, the government must not be allowed to continue with a corrupt practice aimed at providing unfair media advantage to the Congress president. The Bill aimed at curtailing the powers of the state Governor acting as the chancellor of the state universities and by giving those powers to the state government has evoked strong reactions. Legislators of the opposition parties namely the Congress and the BSP on May 12 in an unprecedented action overturned tables and broke chairs in the Assembly in protest against the Bill. They demanded that a broad-based select committee should debate the pros and cons of the Bill before submitting its report to the House. In the House today, parliamentary affairs minister Parkash Pant moved a resolution for the passage of the Bill. But, leader of opposition Harak Singh Rawat opposed the move and suggested that the Bill be sent back to the select committee. He also objected to the alleged unfair representation given to main opposition party, the Congress, in the select committee. Later, Munna Singh Chauhan, a ruling BJP legislator, moved a resolution for sending back the Bill to the select committee, which was approved by the House. The term of the select committee has also been increased by another month. The Uttarakhand assembly today suspended 11 opposition legislators for their misbehaviour on May 12. However, the government bought peace with the opposition by suspending the opposition legislators at the fag end of the days’ proceedings. The House was later adjourned sine die. On May 12, opposition legislators had created a ruckus in the House by overturning furniture to oppose the tabling of the Uttarakhand Universities Bill aimed at giving more powers in the affairs of the state universities to the state government. Speaker Harbans Kapoor had issued notices to two Bahujan Samaj Party (BSP) candidates and nine Congress legislators. The House on a privilege motion, moved by the ruling party, decided to suspend the 11 opposition legislators till the remaining part of the session. However, no sooner did the motion was adopted, the Speaker adjourned the House sine die. A five-month-old baby, stated to be the daughter of Congress worker Abul Hasan, was killed when CPM cadres attacked Hasan’s house near Behrampore town with bombs and firearms. With the baby’s killing, the death in Murshidabad district now stood at 22. In the adjoining Birbhum district also severe clashes between the supporters of the CPM and the Trinamool Congress took place. The most violent incident occurred at Nanur where five persons were killed during the past 24 hours. There were incidents of a large scale violence and burning of houses belonging to Congress workers in five districts where food grains stocks in granaries were also burnt. At least two persons had lost their eyesight due to the bomb blast during the clashes between CPM and FB workers. At Basanti in south 24-Parganas, where three RSP workers were killed by CPM workers during the May 14 elections, one more person had succumbed to his injuries at the SSKM hospital. Re-polling took place in 18 areas today where the elections were disturbed on May 14. Meanwhile, Mamata Banerjee demanded the imposition of President’s rule in the state and re-pole to the Assembly. The party has called for intervention of the central government in containing the factional feud, alleging that the Democratic Alliance of Nagaland (DAN) government led by Neiphu Rio has remained a mute spectator to the clashes occurring in and around Dimapur town that resulted in the death of over 40 persons during the past two months, including 15 rebels who were killed last Friday. All business establishments, financial institutions, offices, educational institutions remained close during the bandh. The roads and streets wore deserted look while people chose not to venture out during the bandh period. Official sources informed that there was no report of any untoward incident. Meanwhile, bowing to mounting pressure from the civil society groups and the Church, the district administration today instructed all NSCN rebel groups to vacate civilian residential areas in the town or face stern action. The district-level coordination group of security agencies has threatened to begin flush-out operation if the rebels fail to vacate their shelters in Dimapur and the adjoining areas. In the wake of last Friday’s bloodbath near Dimapur town, people and the Church have demanded that the government must drive away the NSCN rebels from their shelters in the civilian areas as the rebels are supposed to stay put in designated camps as per the ground rules of ceasefire with the government of India. The NSCN-IM signed truce with the government in 1997. There was a fractionation in the rebel group of late with the formation of the NSCN (Unification) by a section of its leaders. The fractional has spawned worst rivalry and hatred between the two factions that are now engaged in on and off gun battles in civilians-inhabited areas in and around Dimapur. Earlier, the Nagaland cabinet had directed the police and security forces to enforce ceasefire ground rules under standard operation procedures (SOP) following Friday's bloody violence, official sources in Dimapur informed. Though the circumstances in which talks are being held are not very opportune as there is not only political instability in Islamabad after withdrawal of PML (N) ministers from the coalition government by former prime minister Nawaz Sharif but also a growing threat from the fundamentalist forces, New Delhi is going ahead with bilateral dialogue to assess the political will of the new government in Islamabad. Moreover, there is considerable international pressure on both India and Pakistan to continue talks, particularly after the restoration of democracy and installation of a democratically elected government in Islamabad. Even the task of External Affairs Minister Pranab Mukherjee is not easy as the UPA government enters into its fifth year on May 22 and the coalition government prepares itself for a General Election next year. Recent events like the Jaipur serial blasts, spurt in infiltration and ceasefire violations by Pakistani forces in Samba, Tangdhar and Keran in Jammu and Kashmir has further limited the options of New Delhi. In the above-mentioned circumstances, while India would definitely be putting the issues of terror, infiltration and ceasefire violations on the table during the talks some confidence-building measures on the agenda would also keep the momentum of talks going, sources said here. India is expected to propose increasing the frequency of the fortnightly Srinagar-Muzaffarabad and Poonch-Rawalakot bus services to make these weekly, official sources maintained. The Foreign Secretaries of the two countries will meet tomorrow to set the agenda for talks between Pranab Mukherjee and his Pakistani counterpart Shah Mahmood Qureshi on Wednesday, which will mark India’s first high-level contact with the new Pakistan government. During the much-delayed talks, the two sides will review the fourth round of composite dialogue and assess progress made on eight issues, including Jammu and Kashmir, terrorism, Siachen, Sir Creek and CBMs. At the talks, the Indian side is expected to press for launch of Kargil-Skardu and Jammu-Sialkot bus services as part of additional initiatives to increase contacts between people on two sides of the LoC, the sources said. operationalisation of the truck service on Srinagar-Muzaffarabad route will also be discussed, they said. India has already made all preparations, including widening the road between Baramulla and Kaman post, the last point on this side of LoC, and establishing other infrastructural facilities. Liberalisation of the permit system used for travel across the LoC will also be on the agenda, the sources said. The two sides will also deliberate on liberalisation of visa norms to encourage more travel between the two countries. India has already made several proposals, including packaged tours and increasing the number of pilgrim places that could be visited by people from the other country. Mukherjee and Qureshi will also discuss ways to resolve the vexed Siachen issue. The two sides have already agreed in principle to demilitarise the mountainous zone but Pakistan has been refusing to authenticate the present locations of troops of the two countries. India, while favouring conversion of Siachen into a Mountain of peace , has refused to relocate the troops without proper authentication. Foreign minister Shah Mehmood Qureshi has met President Pervez Musharraf to discuss with him the fourth round of the Pakistan-India foreign ministers’ talks. According to a private TV channel, Shah Mehmood Qureshi today met President Musharraf to discuss the upcoming talks with Indian foreign minister Pranab Mukherjee. Mukherjee is arriving in Islamabad for the talks today. Sources said during the meeting at the presidency in Islamabad, Qureshi and Musharraf discussed the progress made in the Pakistan-India talks during the first three rounds. Qureshi told the President that during the talks the two countries would discuss exchange of prisoners, visa policy and bilateral trade. It was decided that the Kashmir issue should top the agenda for the fourth round of talks, scheduled for May 21. The Indian foreign minister would also meet with President Musharraf, PPP co-chairman Asif Ali Zardari and PML-N Nawaz Sharif during his stay in Pakistan. Close on the heels of Indo-Pak dialogue, beginning May 20 with the foreign secretary-level talks in Islamabad, Jammu and Kashmir Congress chief Saifuddin Soz today indicated that time was ripe for talks with the Hurriyat. He also hinted at a strong possibility of the Hurriyat reshaping its response to the political scenario in view of the changed circumstances in the subcontinent. “The process of dialogue is on. Anyone who wants to talk to the Prime Minister is welcome to talk and can talk, including the Hurriyat. Doors for talks are open,” Soz said in an exclusive interview to The Tribune today. He, however, did not list any time frame for such talks, saying, “I do not know whether there is a time frame for talks with the Hurriyat. But they can talk if they want to.” Soz is also learnt to have conveyed this feeling (regarding restarting talks with the Hurriyat) to Prime Minister Manmohan Singh, a development being viewed as significant in the run up to Jammu and Kashmir polls. Soz was referring to the democratically elected government in Pakistan, which, he said, had “rejected gun and violence as a means for the resolution of political problems.” “The newly-elected government in Pakistan feels that the gun culture will not yield any result on ground. That’s a good omen. There is now a belief that smaller and bigger differences can be resolved through dialogue,” Soz said. The last time the Centre talked to the moderate faction of the All Parties Hurriyat Conference, there was agreement on the need for an institutional structure to conduct future talks. Sources in the government indicate that proposals for evolving such a framework are ready. The Centre for Dialogue and Reconciliation (CDR), which organised the Kashmir interface, attended among others by a nominee of Asif Ali Zardari, president of Pakistan People’s Party, has submitted its recommendations to the Centre. Primary among them is the establishment of truth and reconciliation commission to deal with cases of human rights violations in the Valley, and reinvigoration of Indo-Pak peace talks. Convener of the recently constituted ‘Movement Against Terrorism’ Maulana Khalid Rashid Firangi Mahali is drafting a letter to this affect. He is an executive member of the All India Muslim Personal Law Board. Maulana Khalid Rashid said as there was no comprehensive list available about the mosques across the state, the letter was being dispatched to Muslim organisations in various cities. “They in turn would forward it to the imams in their areas,” he said. The initiative was taken following the Jaipur blasts and reports that the suspects might have received support from the locals. “We are keen to spread the message in rural and remote areas regarding the growing threat of terrorism and the manner in which innocent people were being misused for nefarious purposes by these terrorists,” Maulana said. On February 2, Muslim clerics and activists from across the state had assembled at Sahkarita Bhawan in Lucknow to address the problems faced by the community following the rise of terrorism. It was also decided to constitute a body called ‘Movement Against Terrorism’. The agenda of the body is to spread awareness about the un-Islamic activities of the terrorists amongst the Muslims so that no gullible person becomes their victim. At the same time, the body is also trying to clear doubts regarding Islam and terrorism amongst the common people so that Islam is not seen as synonymous of terrorism, underlined the Maulana. “At least 40 people are admitted to three hospitals in Krishnagiri district in a critical state and many of them might lose their eyesight. Majority of the victims are poor agricultural labourers and some of them travel to Bangalore to work as coolies. While passing through Kolar they consumed the illicit brew,” he added. Officials apprehend that the death toll might go up in the coming days. Tamil Nadu police said though the illicit brew was not distilled within the state, a man and a woman were held under the Bootleggers’ Act on charges of smuggling it in to Krishnagiri, 250 kms from here. Meanwhile, angry women belonging to villages in Hosur, bordering Karnataka, attempted to cross over and attack local arrack shops in Anaikaal from where the Dalits bought the killer brew but were prevented by the police. The Dalit inhabitants of Anaikaal drank the liquor during the early hours of Sunday during the 13th-day ritual of a funeral. However, three of them died immediately after consuming the brew which was suspected to be poisonous rectified spirit. A majority of the victims were alcoholics and the sole bread-earners for their families. It is a usual practice among poor villagers in the districts of Tamil Nadu, adjoining Karnataka, to cross over and purchase illicit liquor sold in pouches as they are available at a cheap rate of Rs 12 each. Though assembly elections were being held in Karnataka, the police actually did not enforce prohibition and illicit liquor was being sold openly. The row between the BJP-ruled state and the Centre saw Patil hitting back at Raje today and taking a dig saying she is “perhaps shaken” after Jaipur serial blasts which brought under scanner illegal Bangladeshi migrants in Rajasthan. Raje said the state government had written numerous letters to the Centre from time to time on the issue of deportation of Bangladeshi nationals who were finding their way into Rajasthan. “We wrote to them in June 2007 to say, look we need to do something about this. We got a reply back from them (Centre) saying, well why don’t you just collect them and put them into a transit camp somewhere,” Raje told NDTV. The Chief Minister said such a suggestion was received from the home ministry. Asked if the home ministry had formally written to the state government to “round up” illegal Bangladeshis, she said, “Yes...kindly round them up and put them in a transit camp, which you pay for”. The Chief Minister admitted it was something like asking the state to “set up its own Guantanamo Bay (where the US security agencies keep terror suspects)”. But Patil did not hide his displeasure at Raje’s claims when he refuted her charge and said her statement only exposed her “weakness” in tackling terrorism. “Perhaps she (Raje) is shaken after the recent blasts and is saying anything that is not true. She should have avoided it (making the statement). She has just exposed her weakness,” Patil said. The Home Minister said that Raje was making one statement after another. “Why she is making such statements, I do not know,” he said adding “we are not happy with her behaviour”. “Our country is not a monarchy. It is a democracy,” he said. Raje’s remarks came in the backdrop of the Centre and the Rajasthan government trading charges over the issue of intelligence failure following the serial blasts. To a question that under what law the state could detain people in a transit camp, the Chief Minister said, “We have been asking the same question (to the Centre).” With the needle of suspicion pointing towards Bangladesh-based terror group Harkat-ul-Jehadi Islami (HUJI) in the May 13 serial blasts, the Rajasthan government has launched a manhunt to identify Bangladeshis “having criminal background” in the state within the next 30 days. With the issue of illegal Bangladeshis becoming a sensitive matter in the aftermath of Jaipur blasts, the Congress said they should be dealt with as per law of the land, but accused Rajasthan Chief Minister Vasundhara Raje of playing politics on the issue. A vacation Bench comprising Justices C.K. Thakker and L.S. Panta passed the interim order on the appeals filed by the Centre and some candidates and issued notice to one Ramesh Ram on whose petition the high court had restrained the declaration of results based on the merit list prepared by the UPSC. However, after filing of the petition by the Centre on May 16, the UPSC had declared the results for 2007 on the basis of the order passed by the high court. The UPSC has made it clear that the results declared by it were provisional and would be subject to the outcome of the appeal pending before the apex court. The matter related to the rule allowing the adjustment of vacancies in the unreserved category with that of reserved category. The Bench sought response within three weeks from those who were opposing the rule. The high court had held as ‘null and void’ Rule 16 (2) of the Examination Rules of the Government of India for Civil Services Examination saying that it ran counter to the benefit of Scheduled Castes, Scheduled Tribes and OBC candidates and was not affirmative, progressive and pragmatic in achieving social justice. These questions referred to non-nomination of his elder son by Shivaji on the grounds allegedly of his being “licentious” and use of the term “mutiny of sepoys” in 1857. Facing the heat on account of inclusion of such language in its question paper, the UPSC today clarified that it held Chhatrapati Shivaji and his family in the highest esteem and respected the sacrifices of countrymen in the First War of Independence. “We have no intention whatsoever of causing any offence to any section of our people,” the commission stated. Under pressure for objectionable use of language, the UPSC today decided to delete the said questions from the paper. “We will streamline the mechanism to avoid such occurrences in future,” it clarified. Civil society organisations across Jharkhand are enraged at the way local police handled the case of murder of 36-year-old Lalit Mehta. Mehta’s body, which was recovered from the roadside on a stretch between Daltonganj and Chhattarpur, was sent for a postmortem, and buried after being declared “unclaimed”. Though local police say they tried their level best to locate the whereabouts of Mehta, social activists from the region feel the rush was deliberate and was meant to hush up the case. “We managed to exhume Lalit’s body only on May 17. It was finally handed over to his family, who then cremated it,” said Balram, state adviser to the Supreme Court commissioner on Right to Food, and a close associate of Mehta, who was allegedly under threat from powerful local lobbies. The latter did not want Mehta to support the social audit of National Rural Employment Guarantee Programme works in Chainpur and Chhattarpur blocks of Palamau district. Mehta was an engineer with civil background and had chanced upon several irregularities in rural employment works in the area. Today, 40 civil society organisations associated with the Right to Food Campaign in Jharkhand, State NREGA Watch and Gram Swaraj Abhiyan campaigners met and decided to hold a dharna outside Governor House in Ranchi on May 25. The dharna will be followed by a public hearing on the NREGA, to be held in Chhattarpur block in Palamau on May 26. “Fair investigation is our only concern,” Jean Drèze of Allahabad University, whose team is conducting the social audit, said. Activists are also expected to meet Jharkhand Chief Minister tomorrow to hand over a written representation demanding CBI enquiry into the brutal killing. They have also sent their requests to the Prime Minister. At least five general category candidates were recommended to be adjusted against vacant posts reserved for the Scheduled Caste and Backward Class candidates, even though these were required to be carried forward in the absence of qualified candidates. Sources in the Haryana government say a notification for filling up the posts was issued on May 18, last year, in form of an advertisement. In all, 22 Additional District and Sessions Judges were to be appointed in Haryana. Out of the total, as many as 14 seats were to be filled up from candidates belonging to the general category, while five seats were reserved for the Scheduled Caste candidates. Another three seats were to be filled up from among the candidates belonging to the Backward Class. In fact, the notification (No.193 Gaz.I/VI.F.2) clearly says: “Applications are invited for selection of 22 (twentytwo) candidates (14 from general category; 5 from Scheduled Caste category and 3 from Backward Class category) for appointment to Haryana Superior Judicial Service by direct recruitment, in the State of Haryana through competitive examination under Rule 6(1) (c) of Haryana Superior Judicial Service Rules, 2007”. After the selection process, only two Scheduled Caste candidates and one Backward Class candidate qualified. As such, three seats belonging to the Scheduled Caste category, and another two seats meant for the Backward Class category remained vacant. Rules say instead of adjusting the general category candidates straightaway, vacant seats are required to be carried forward. The intention is to enable these to be filled up from among the reserved class candidates in subsequent selections. Even the Supreme Court, in a judgement, has said so. But, the selection committee recommended to the Haryana government the appointment of general category candidates against the post advertised for the Scheduled Caste and Backward Class candidates. According to the sources, for the purpose, provisions of Haryana Superior Judicial Service Rules, 2007, were relaxed. The selection has already come under the Apex Court’s scanner. Taking up a petition for quashing the Punjab and Haryana High Court’s recommendations for absorbing the presiding officer of fast-track courts in regular cadre of Additional District and Sessions Judges, the Supreme Court has issued notice. The respondents had joined on a contractual basis as presiding officers of fast-track courts in March 2004. The petitioner has claimed the recommendation was in violation of the Haryana Superior Judicial Service Rules, 2007. As such, the state of Haryana should be restrained from appointing the respondents to superior Judicial Services. In the government, so far no discussion has been initiated to review the further continuation of the ceasefire between India and Pakistan. The ministry of defence has prepared a note and will also apprise external affairs minister Pranab Mukherjee, who is expected to take up the matter of repeated unprovoked firing and attempts of militants to infiltrate into India with his Pakistani counterpart Shah Mahmood Qureshi. Coming just a day ahead of the scheduled Indo-Pak talks, the firing is being viewed as a serious incident in the South Block. Defence authorities today clarified that the Indian director general of military operations (DGMO) has not called up his Pakistan counterpart on today’s incident. Sources, however, said that the army authorities at Mendhar lodged a strong protest with their Pakistan counterparts. It was conveyed that the firing continued for 15 minutes, during which under-barrel grenade launchers were used and light machine gun fire was directed at Indian observation posts. Defence authorities believe that no firing could have taken place without the tacit backing of the Pakistan troops. It is tough to believe that the Pakistanis did not know that such heavy firing was being carried out at the border. Separately, Pakistan has conveyed that it has started its own enquiry into a violation of the ceasefire at Tangdhar a few days ago. This was done after the DGMOs of both the countries spoke and the Indian DGMO lodged a strong protest and even gave out details from where firing had been directed by Pakistani troops. 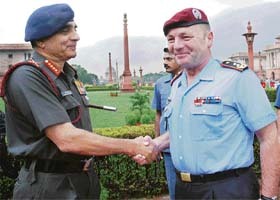 The ceasefire was in the aftermath of Operation Parakaram, when India and Pakistan, reached the threshold of another war after the Parliament attack in 2001. It was agreed to observe a ceasefire along the international border, the LoC and the actual ground position line in Jammu and Kashmir from November, 2003. The High Court had held as “null and void” the election of Jacob finding him guilty of corrupt practices under the Representation of People Act (RPA). An apex court vacation bench of Justices C.K. Thakker and L.S. Panta said the stay of the High Court order will continue till the final outcome of the appeal before it. The bench issued notice to A Narayanan, a voter of the constituency, on whose petition the High Court had set aside Jacob's election. Narayanan had accused the MLA of indulging in corrupt practices to win the election held on April 29, 2006. The bench granted him four weeks to respond to the appeal filed by the MLA. Jacob had defeated the UDF candidate and former minister T. M. Jacob by a margin of 5,150 votes. The economic loss in India, which was $ 8.7 billion in 2005, is projected to rise to $ 54 billion in 2015, according to the report, "Preventing Communicable Diseases in the Workplace through Diet and Physical Activity". The projected loss for China - the other fast developing country - is a massive $ 558 billion, while the estimated figure for Russia and the UK is $ 33 billion. The estimated income loss in Brazil in 2015 would be $ 9.3 billion, while in Pakistan $ 6.7 billion, Nigeria $ 1.5 billion and Canada $ 1.5 billion. The report was presented to the World Health Assembly in Geneva today. This report, the outcome of an event jointly organised by the World Health Organisation (WHO) and the World Economic Forum, summarises the current evidence available in addressing the different dimensions of the workplace as a key setting for interventions designed to prevent Non-Communicable Diseases (NCDs) through diet and physical activity. Enhancing employee productivity, improving corporate image and moderating medical care costs are some of the arguments that might foster senior management to initiate and invest in programmes prompting healthy workplaces. In 2005, an estimated 35 million people died of non- communicable diseases such as heart disease, stroke, cancer and diabetes. Around 80 per cent of these deaths occur in low and middle-income countries that also have to deal with the burden of infectious diseases, maternal and prenatal conditions and nutritional deficiencies. Key elements of successful Workplace Health Programme (WHP) programmes include establishing clear goals and objectives, linking programmes to business objectives, strong management support, effective communication with and involvement of employees at all levels of development and implementation of the WHP programme. Mumbai: The number of diabetic patients will increase three times by 2025, according to the Diabetes Endocrine Nutrition Management and Research Centre (DENMARC), which is a group of doctors working on the reduction of the disease for the last two decades. DENMARC director H.B Chandalia, while announcing 'Defeat Diabetes' here today, said the number of diabetic patients was on the increase due to change in lifestyle and diet in the country. DENMARC has organised a three-day event, 'Defeat Diabetes 2008', at the Nehru centre starting from May 23 to 25, which will be inaugurated by Nita Ambani. ''The diet change along with inadequate exercise has been one of the main reasons for the increase in type II diabetes, which can be reduced by 58 per cent with proper diet and exercise,'' Dr Chandalia said. Dr Vijay Ajgaonkar, a consultant diabetologist, said the disease can be cured to some extent with proper exercise and right diet which is much needed. The age-group suffering diabetes in India has come down by a decade as compared to the international average, he said. During an interview with The Tribune at his residence here, a grim-looking Negi said successive state governments had failed to recognise his six-decade-long contribution towards promotion of Garhwali folk songs. Born in 1927 in Ayal village in Pauri Garhwal, octogenarian Negi feels that it is high time the government woke up and put a check on the increasing vulgarity both in lyrics and videos of songs. Negi is the first Garhwali singer whose compilation of six Garhwali folk songs was recorded on gramophone by Young India Gramophone Company of Bombay in 1949. Negi did not receive any formal music training. With the broadcasting of Garhwali songs from AIR Delhi in 1954, it was Negi's songs that were the first to be aired. His popular number “Tu holi oonchi dandyon ma ghasyari ka bhes ma” (She must be on high mountain paths working as a grass-cutter) became so famous that it found special mention in the Uttar Pradesh Rural Survey report, 1961. Credited with training many musicians, who later became popular folk singers in Uttarakhand, Negi says, "I never thought of making money. My aim was to promote Garhwali songs in the entire country. But what hurts me is that today singers who do not even knows the basics of singing are making lakhs, besides enjoying benefits offered by the government. And a singer like me who devoted his entire life for Garhwali music is living in misery. Not getting recognition from the government, has really pained me." Negi has demanded that there should be a censor board for a check on “vulgar” video albums. What is noteworthy is the fact that Negi's work is not restricted to singing only. A multifaceted personality, Negi has penned down several songs, plays and also worked as assistant music director in the National Gramophone Recording Company in Mumbai. Besides, he was also assistant director of Hindi movies like “Khalifa” by Movie India Company and “Chaudhayi Raat” by Moon Art Picture. Currently, Negi is associated with several national and international cultural organisations. To promote the production of bamboo and generate awareness about its manifold uses, the ‘poor man’s wood’ is being cultivated in the ‘demo village’ near Sahaspur, in Dehra Dun district, by the Forest Research Institute (FRI). The overall objective is to apprise farmers and frontline forest staff of the utility of bamboo. Due to its invasive behaviour and orthodox attitude of farmers, the cultivation of bamboo faces many obstacles. Therefore, despite its potential use in day-to-day life, bamboo farming is not very popular here. FRI, one of the pioneer institutes of the Indian Council for Forestry Research and Education (ICFRE), has taken up the task of spreading awareness and cultivation of bamboo in the state. There are total of eight institutes enrolled under ICFRE and each of them looks after one ‘demo village’. The ‘demo village’ in Uttarakhand started in early January this year and possesses modern hi-tech nurseries and other useful agro-models. The village serves the function of transfer of new technology from the researchers to the frontline forest staff. Dr Ravindra Kumar, deputy director-general (extension), ICFRE, expressed his concern over less productivity of bamboo in Uttarakhand. “In India, there are more than 120 species of bamboo that are registered, out of which around eight species are found here. But farmers have a purely negative attitude towards bamboo farming as they believe that its cultivation makes the soil infertile,” he said. “In order to make frontline forest staff and farmers understand the latent potential of bamboo, these ‘demo villages’ have been set up. Not only will they provide information about bamboo farming but also carry out extension activities,” added Dr Ravindra. Highly-placed sources in the investigating agency said Fernandes, who was the Defence Minister in the NDA government, was quizzed by a team of CBI officials at his 3-Krishna Menon Marg official residence on two occasions regarding alleged irregularities in the purchase of seven Barak Missile Systems. “The Somali pirates have not made any demands yet,” Andrew Mwangura of the East Africa Seafarers Assistance Programme said today, adding that there were no leads about the missing ship yet. The Mumbai-based Directorate General of Shipping said the vessel - ‘MV Victoria’ - was commandeered close to the war-ravaged Somalian capital Moghadishu on Saturday, during a string of attacks off the lawless Somali coast. The humanitarian aid was being sent to Moghadishu that has been hit by severe food shortage. “We are working for more details. Ship-owners are supposed to inform, but they have not. We are trying to get more information,” a top directorate official said. Mwangura informed that the vessel sailed from Mumbai earlier this month carrying 4,000 tonnes of sugar in a shipment of humanitarian aid, but went missing about 55 kms off the Somalian coast. The vessel has been registered in Jordan. The toll in the city rose to 25 this afternoon, while more than 50 victims, residents of the areas along the teeming Tannery Road, were battling for lives. Doctors in the Government Bowring hospital said the victims were being given treatment on a war footing, but nothing could be said for the next 24 hours. In the Kolar district, the death toll rose to 20, after five more persons died since this morning. Twenty others were battling for their lives in the district government hospital. The victims belonged to Narasapura, Belur and Tyakal villages. The alleged corruption came to light when BJP national vice-president and former union minister Bijoya Chakravorty alleged on Saturday that the amount was paid within one day of the issue of work order. She also distributed photocopies of purported documents and alleged that the state's ruling Congress was collecting funds to win elections by siphoning off central funds meant for development. Reacting to Chakravorty's allegations, Kipa said in a release today that the payment was made on the basis of certificate issued by the concerned deputy director of school education and he had already been suspended. The Khandu Dorjee government, he said, had promised to root out corruption and appealed to people not to be misled by BJP allegation. Chakravorty, who came here to oversee BJP's preparation for the panchayat elections slated for May 26, alleged the Congress took away eight of the nine BJP MLAs into the party-fold by alluring them with huge amount. Religious events at Hardwar on the eve of Budh Purnima are proving as crowd pullers for the holy town, these days. Sant Bapu Aasa Ram’s Bhagavadgita satsang at Pantdeep, on the city's outskirts and Ram katha at another outskirt managed to pull lakhs to this town. Bapu's three-day-long religious event that started on Sunday and will conclude on today, was the biggest event on the eve of Budh Purnima, where more than three lakh followers of Aasa Ram Bapu from across the country participated in the event which comprised Bhagavadagita’s preaching, satsang (religious songs) and “dikhsa”, followed by special prayers in the evenings. Another similar big event on Budh Purnima was Ram katha at an ashram at Khar-Khari, where thousands of Rama’s devotees reached from different parts of India. While these events pulled a huge crowd, the Hardwar police too claimed to handle the crowds gently. Police officials concerned said that all the preparations have been made in view of Budh Purnima. Special checking points have been set up and and day and night patrolling teams have been constituted. “As Hardwar is the religiously important venue for these kind of events, so our force is always ready to face the rush,” a police officer added. The local MLA from Manglore, Kazi Nizamudin, who had come on a surprise inspection to the civil hospital had to face the wrath of the patients. “We are repeatedly persuaded to purchase medicines from private shops on the pretext that medicine was not available in the hospital. Because of this we have to bear the financial burden,” rued a patient. The amount will be received by the respective state rural roads and national rural roads development agencies. An amount of Rs 6 crore has been sanctioned as the first installment of grants-in-aid to the NRRDA during 2008-09 for meeting the expenditure on its activities. The Punjab Roads And Bridges Development Board, Chandigarh, which is an autonomous agency for receiving the funds for the PMGSY has been sanctioned Rs 143.43 crore as balance payment of the second installment of phase-VI PMGSY Project (2006-07). The Rajasthan Rural Roads Development Agency has been allocated Rs 500 crore as part payment of the first installment of phase-VII (2007-08) of grants-in-aid under the scheme. The Uttarakhand Rural Roads Development Agency has been granted Rs 46.86 crore as the second installment of phase-IV (2004-05) towards the PMGSY. All these agencies will maintain separate account for the grant and submit a utilisation certificate and audit reports for the amount already released and being released at present to claim further amount due. The authorities have ruled out any threat to Taj Mahal and expressed satisfaction with the existing security arrangemnts. Atul Kumar, ADG (security) Uttar Pradesh, superintending archaeologist, ASI, Agra along with senior officers and members of the standing committee of the security of the Taj Mahal visited and inspected the entire Taj Mahal complex, including the security equipments installed recently. 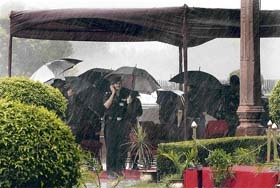 They were satisfied with the security arrangements at Taj Mahal. According to the Central Industrial Security Force (CISF), responsible for the monuments security, there is no security threat to Taj. According to senior police officials, former worker of the company Arvind is missing, along with his family, since the incident and hence, is suspected of the crime. On Friday, some unidentified persons entered the workshop and assaulted watchman Kishanlal and another company worker Rajesh Kushwaha with sharp- edged weapons, thereby injuring them. Subsequently, the accused decamped with Rs 1.25 lakh. Rajesh died on the spot and Kishanlal died on Saturday at a local hospital. On the basis of circumstantial evidence, the police was of the view that they were poisoned by the accused before they were attacked with sharp-edge weapons and rods. But now, the post-mortem report has made it clear that Rajesh and Kishanlal died due to internal hemorrhage. Arvind, who hails from Bijnor, used to work with the tubewell company owned by Modi group, but was dismissed from services few months ago. SSP Amit Kumar Sinha said raids were being conducted at different places and Arvind would soon be in the police net. The police has also announced a cash reward for providing information about Arvind. “Anyone having any clue about Arvind’s whereabouts can call at 9411112963 and 9411112823”, police officials said. One of the deceased has been identified as Abdul Rasid. The police said the accident was the result of rash driving on the part of bus driver Rajinder Kumar, who had been arrested. A case under Sections 279, 338 and 304-A of the IPC has been registered at Bajpur police station. Meanwhile, the Dehra Dun police has booked three members of a family on the charges of demanding dowry. Acting on the complaint of Asha Mishra, resident of Kavli, a case has been registered against her husband Gaurav Mishra, father-in-law Shidanand Mishra and mother-in-law Sushma Mishra. No arrest has been made so far. ''India is making a determined effort to extend basic social security coverage and a number of important measures have been initiated, especially in the informal economy,'' Somavia said while addressing the 'Asia-Pacific Regional High-Level Meeting on Socially Inclusive Strategies to Extend Social Security'. While students of the Chennai, Ajmer and Panchkula regions will get their results on May 21, results of the Delhi, Guwahati and Allahabad regions will be declared on May 23. The results will be posted on the board’s website.